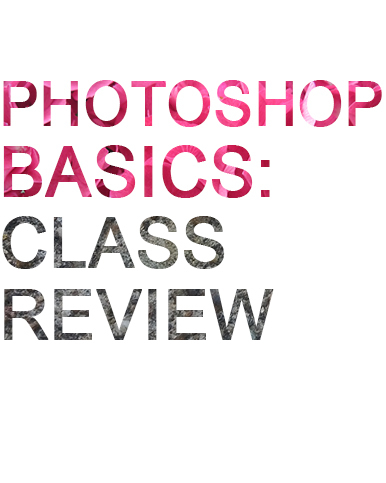 I purchased the Basics of Photoshop: Fundamentals for Beginners ecourse over at Skillshare so I could start learning how to use the program and help with my blog redesign. I paid for the course myself and was not compensated for my opinions. I’ve been procrastinating about learning Photoshop for a long time. 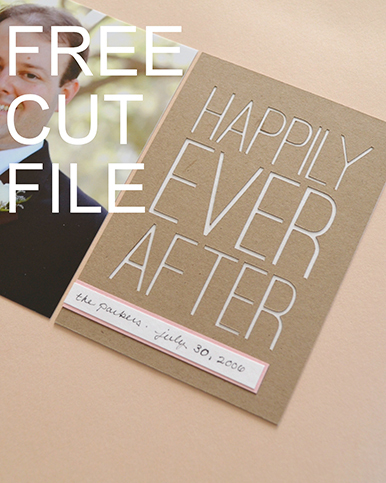 I still use Microsoft Word to lay out and print my photos and to design things like this Project Life-style card. 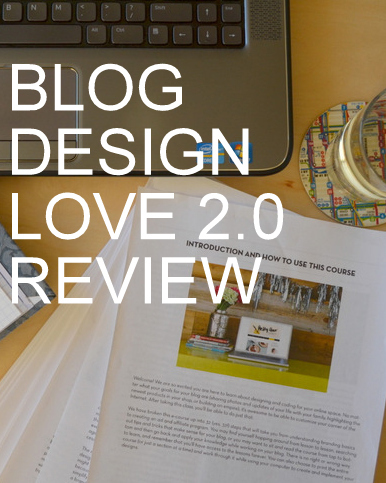 I purchased the Blog Design Love 2.0 course, which assumes students can do basic image editing. I wanted to get the most out of that course so it was time to learn Photoshop. I tried Skillshare because of the emphasis on creative classes. It felt like the content was geared to me. You can pay a monthly fee and have unlimited access to a library of courses (but not all of them, check to make sure) or pay a one-time fee per course. This was my first Skillshare course, so I paid for it individually. This fundamentals course is taught by Meg Lewis and is for Photoshop, not Photoshop Elements. There are fifteen videos broken up into five units. At first, it didn’t seem like the course covered a huge amount of content. But wow, I’m really impressed at how much I can use Photoshop now! It feels like this. I designed my header image for this blog and the social media buttons. One of my biggest problems with Photoshop is not knowing what any of the buttons do and not knowing how to do what should be something really simple (such as resizing a photo). This course was great. It started off with the very basics including how layers work and keystrokes to make things easy. My favorite thing I learned was how to draw a shape and then insert a photo to fit that shape. It’s how I made my circular profile photo in the sidebar. I even took it a step further and learned how to insert photos into text! Learn how here. I made that! Look forward to some gratuitous pictures-inside-shapes because I’m going to reuse this skill until it goes out of style. Just a couple of small annoyances. All the keystrokes covered in the course are for a Mac. I was able to figure out the PC equivalent (it’s usually Alt or Control) but it would have been nice for the instructor to cover both. The resolution for the videos wasn’t that great. It was hard to see what she was doing unless I went full screen. It was hard to follow along that way because I had to constantly pause, minimize the video, and then go into Photoshop and practice what she just covered. If the resolution was better, I could have had the video and Photoshop open on the same screen. I really liked the course and was surprised at how much I learned. If you have no idea where to start with Photoshop, I recommend it. I’m planning on taking Meg’s other Fundamentals of Photoshop courses to learn more. There are a bunch more courses I want to take at Skillshare generally, like how to hand letter. I haven’t purchased a membership yet, mostly because I don’t know when I will have time to start them and don’t want my membership to end up like a Netflix DVD subscription. 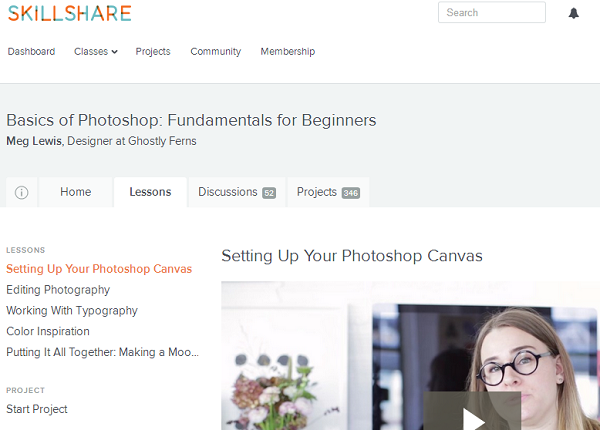 Have you tried Skillshare courses? Let me know in the comments! 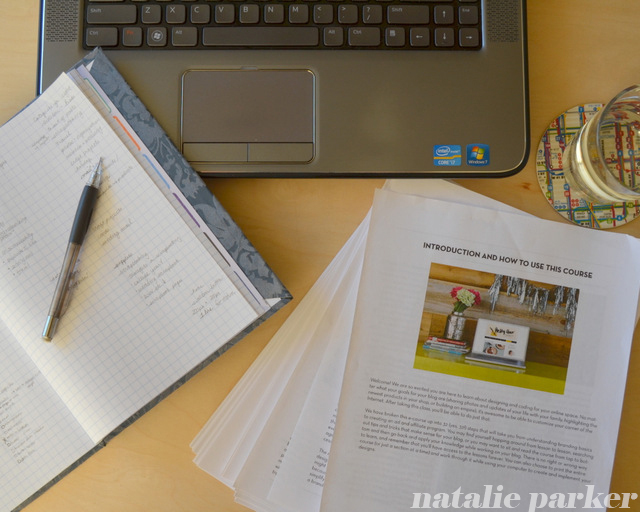 I used the Blog Design Love 2.0 ecourse to help with my blog revamp. Below is a summary of my experience with it. I paid for the course myself and I was not compensated for my opinions. This course covers the Typepad, Blogger, and WordPress.com platforms. I’d been eagerly awaiting the launch of this course. 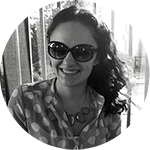 I’ve wanted to redesign my blog for at least a year but never found the time. The course was a great impetus for me to get going! I do know some HTML and CSS but you don’t need to know any to take the course. You do need to know how to do some basic image editing. I took a beginning Photoshop course at Skillshare before starting this course and will post about that in a separate review. The course has a ton of content in it and is a great roadmap if you want to totally revamp your blog from concept to design. I liked how the lessons were divided up. 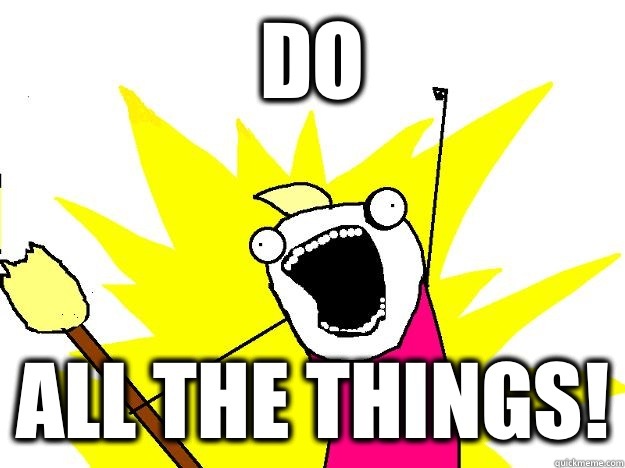 I really liked having all the tasks in front of me and I used them as a checklist and got things done. Even though I know how to code, Elise explained everything very clearly. If you don’t have coding experience, you should be fine. There were a few things in the course I never would have thought to do or didn’t know how to do. I had a couple “why didn’t I think of that?” moments. There are some things in the course that I’m surprised were included, such as how to sell stuff on your site or create an affiliate network. I mean surprised in a good way though and I’m glad I have access to this material if I want to sell anything. If you are a WordPress.com user, some of the design parts of the course won’t be customizable for you unless you purchase the WordPress $30 Custom Design add-on (such as picking custom fonts or coding your navigation bar). I ended up purchasing the add-on so I could get it to look how I wanted. Even with the add-on, you cannot edit a theme’s HTML so you have to make sure the basic bones are where you want them, such as where the navigation bar is located. Some of the things you see here on my site I coded myself and did not use the course (the way I designed my buttons, for example). If you’d like to learn more about coding, you can take this free online course which is how I learned. This course was a great jumping off point for me and I’m glad I bought it. Even though I knew how to do some of the stuff already, it was a great way to organize my thoughts and get going. There is a ton of content and I definitely learned things! If you’ve been wanting to redesign your blog, I recommend it. What if I asked you if you could learn a new language? Not whether you had the time or the desire to. Just whether you could if you wanted to. What if I told you that you wouldn’t need to learn how to pronounce it? What if, unlike other languages, there were set rules and not a lot of exceptions you had to remember? What if I told you that you didn’t even need to become fluent in the language? You just needed to learn a couple of things here and there to get by. Could you learn it if you wanted to? A few days ago, I was chatting with an extremely competent woman. She has an advanced degree and I admire her. We were talking about code. “Oh, I could never do that,” she said. Why not? When we talk about getting more women into tech, we mean other women. When we talk about getting girls interested in math and science and teaching them how to code, we mean girls. Not us. Let’s stop doing ourselves a disservice. Anyone who is reasonably competent can learn how to code. You just have to want to. And if you don’t want to, that’s just fine. Just don’t be unkind to yourself and say you can’t do something when I’m sure you can. I don’t have a computer science degree. I learned just the basics of HTML and CSS. I don’t code every day. I don’t code every month. But I know I am competent enough to learn it and what I know was enough for me to style my own blog. 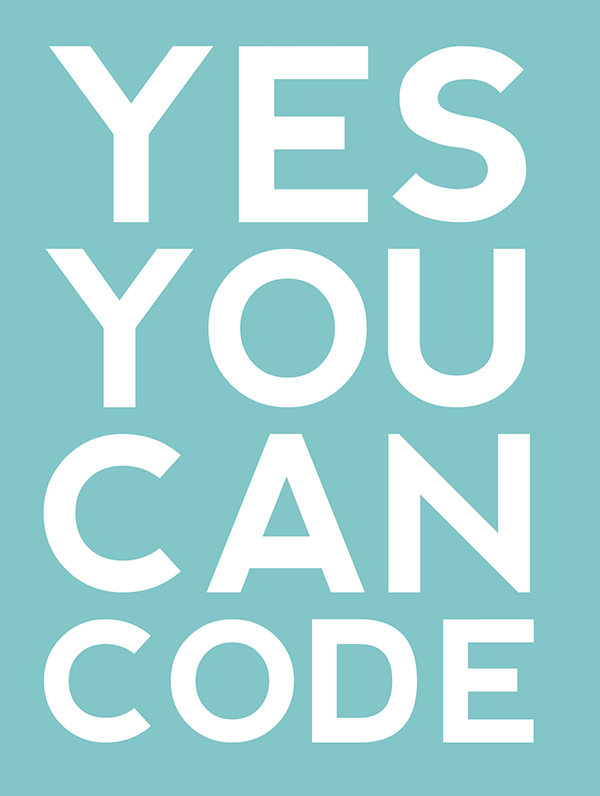 Yes you can code. Not other women, not our daughters. You can. And just knowing that you can is enough. If you’d like to learn HTML and CSS, all the content I used to learn it as a graduate student is available for free online here. My photo printer and I decided to have artistic differences again. I was going to call them irreconcilable differences but we have reconciled and I’m not divorcing it at this time. 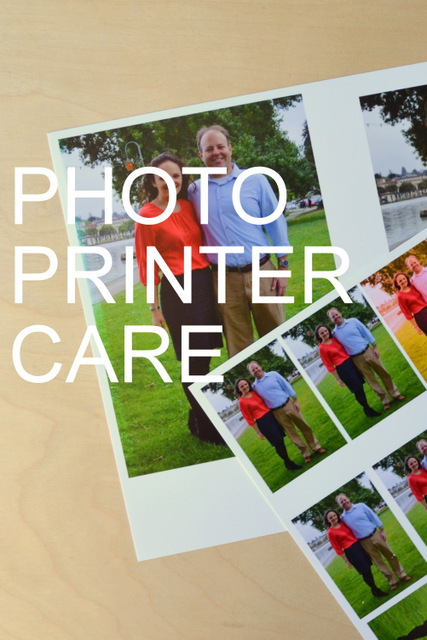 Along the way to solving this issue, I learned a thing or two about photo printer care. Read on! I need to use my photo printer once a week and if I don’t have anything to print, I need to print a test page. I also need a good print backup in case I can’t use my printer. Ordering prints at a drugstore is not good enough. Due to my current creativity issues, a lot of time passed without printing any photos. 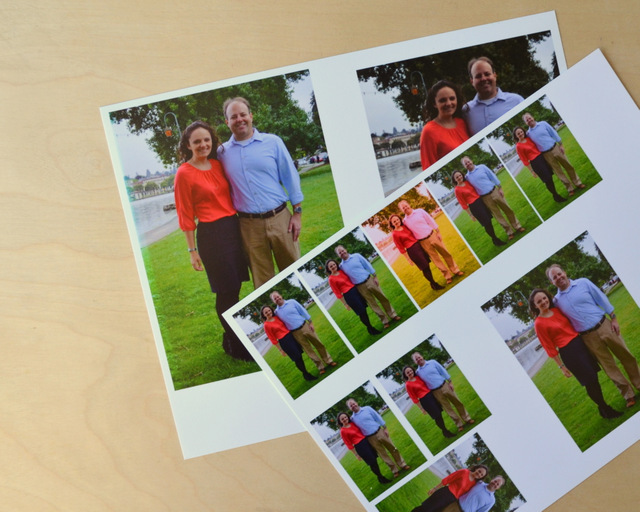 I lost track of time and didn’t realize how long it had been until I wanted to print our anniversary photo. I was worried. I knew from experience a couple years ago (albeit with a cheaper printer) that when I left the country for 2 weeks and didn’t use it, something happened and it wouldn’t print properly. Sure enough, after a few weeks of nonuse, the anniversary photo had lines on it. Noooo! I replaced a low cartridge and cleaned the ink heads several times. After each time I printed a smaller version of the picture. It got better, but not 100%. At one point, the lines went away but then it printed blurrier than the one with the lines! Trying not to panic, I took the printer to an authorized repair shop. He took a look at it and said he couldn’t find anything wrong with it — it was in great shape. It was as fun as thinking there’s something wrong with you but the doctor not being able to find anything. He told me to run a couple more cleaning cycles. So I went home and cleaned it again. After a couple more cycles (I think 10 total by this time) it WORKED! The guy at the shop told me that long periods of nonuse can cause the print heads to dry. He recommended printing something often to prevent this. In the middle of this, I really wanted to finish the anniversary page. So before it was fixed, I used Snapfish to send the photo to my local Walgreens (hoping for instant gratification). Not so much. The color was off and the quality was noticeably poor. I made a PDF to print once a week if I don’t have anything else to print. The printer guy told me to print something that will use each of the cartridges. Many printers come with four cartridges (CMYK – cyan, magenta, yellow, black). My Espon printer has those plus a red and orange. So, if you order prints, whom do you order from? What should I use as a backup service? I use Avery glue sticks for scrapbooking. No muss, no fuss, no special/precious/gimmicky scrapbook glue. I tried to use my glue stick a couple of weeks ago. It had turned to mush. I’m not sure how else to describe it. Perhaps goo is the right word? I buy Avery glue sticks in packs of six. The pack will last me for over a year. I checked the new one I had left in the package and it was mush as well. Any ideas? 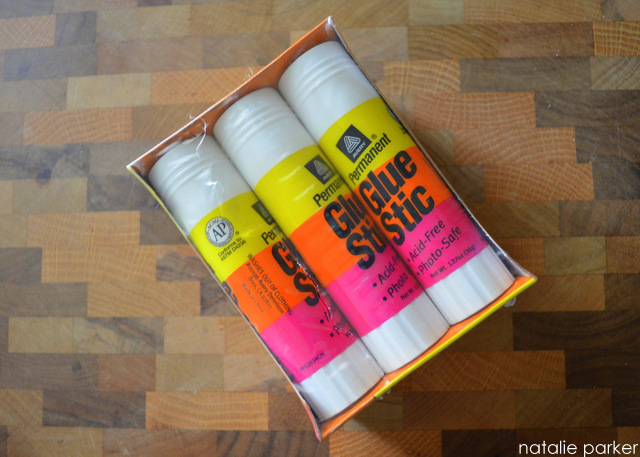 Do your glue sticks expire? 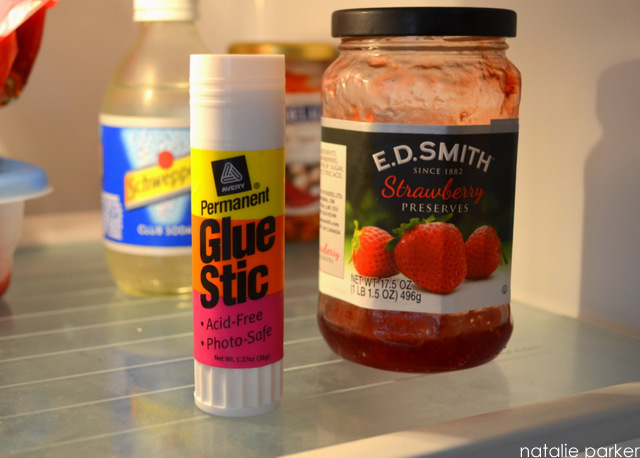 The fridge treatment didn’t work and I replaced the glue sticks with a new set. You will, of course, be the first to know if these new ones go downhill. 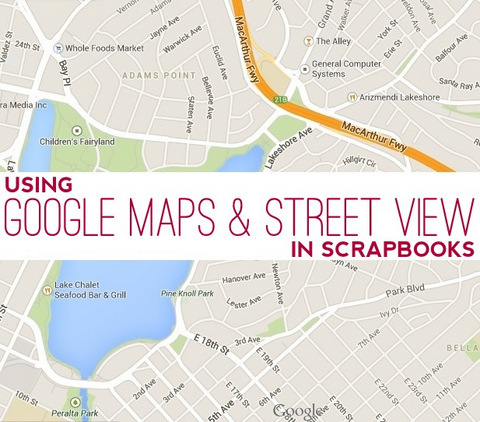 I’ve been using screenshots from Google Maps and Street View in my scrapbooks lately. Here’s a small roundup of examples. I love how a simple screenshot can add so much meaning to a page! 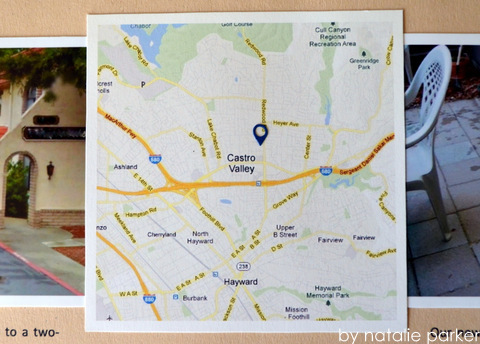 I took screenshots directly from Google Maps and printed them on heavy cardstock. It’s important to get the shot you want on the screen at once — you can’t knit pieces of the map together from multiple screenshots because the map is dynamic. The names on the map will move when it is repositioned. Sometimes I just don’t remember to take pictures. Despite being a scrapbooker and archivist, I can live somewhere and never remember to get a picture of it. Enter Google Street View. 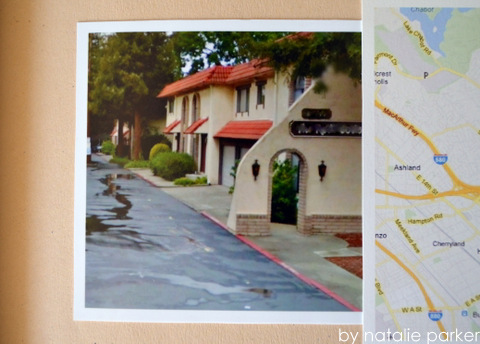 The trick with Street View is: as long as you’re printing a small photo, the resolution will be fine. I find the location I want on Street View, take a screenshot, and save it as a .jpg. Then I’ll open it in Picasa and crop it to the shape I want. Finally, I’ll print it just like any other photo. That’s it! 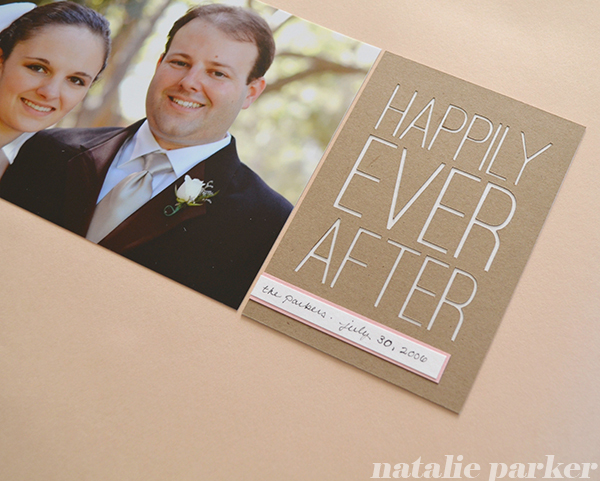 Very simple and I’m really happy I have these images in my scrapbooks. 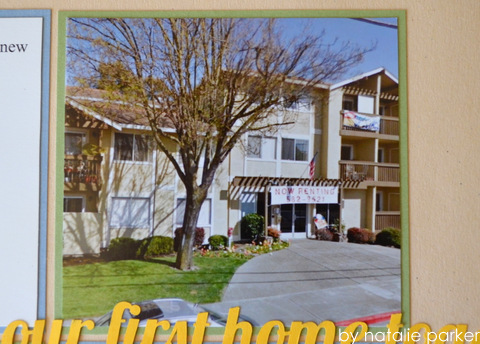 I’m imagining my again-fictional children having a photo to look at when Mr. P and I talk about where we first lived.